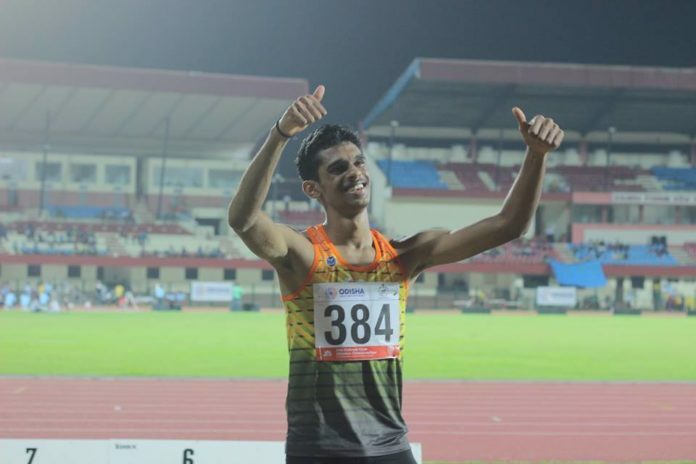 The 58th National Open Olympic Championships saw the third day in play as youngster Murali Shreeshankar made a new national record in the men’s long jump competition. The 19-year-old played for Kerala and cleared a distance of 8.20m which is a new national record in India. Previously the rank holder was Ankit Sharma who jumped a distance of 8.19m at Almaty in 2016. Shreeshankar did a positive start as he covered a distance of 7.95m in his first jump. That effort was better than the previous jump of 7.87m which he made in 2014 in New Delhi. Shreeshankar fouled his second jump but amused everyone with his third jump. The bronze medal went to Haryana’s Sahil Mahabali who secured a new personal best by clearing 7.81m. The jump beat his previous best which was 7.56m. Another glittering performance came through Murli Kumar Gavit who completed a golden double in the 5000m and 10000m at the Kalinga Stadium in Bhuwaneshwar. Gavit won a gold medal in the first day of the competition in the 10000m and created the same impact on 5000m on Thursday. He clocked a relatively slow time of 14.35.96 seconds but that was still enough to beat out Railways’ Abhishek Pal who clocked 14:36.62 seconds to claim the silver medal. Services athlete Man Singh took the third step of the podium after recording a time of 14:37.18 seconds. Chelsea to be slapped with 2 year transfer window ban?